We have tried different approaches to requisitions, but haven't found anything that feels simple and respectful to all the stakeholders. Here I will attempt to write a user story. A user story is a story of a problem so that when we build a solution we have the big picture. The paper form existed in a box on the wall in the office. If anybody needed to spend any money they needed to go to the office and get this paper. Fill it out and put it in another box. Then someone decision maker was to look at it, and make a decision. Then a check was cut to reimburse the cost of the thing or to provide the funds to purchase the thing. If Leigh needs to buy ping pong balls for youth group she would need to do this well in advance. Because the decision maker may not see the requisition until Sunday. Checks must be signed by two trustees who will only be there Sunday. But the check needs to be approved before it can be printed. Sunday is not a great day for printing and approving. There’s a lot of other stuff going on. So requisitions could sit and even get lost. A person could go months without being reimbursed because the whole system relied on people being in the same place at the same time and thinking about requisitions. Ideally we’re thinking about Jesus, the body of Christ, and the Bible on Sunday rather than requisitions. They were really easy to lose. There was no way to track where your requisition was in the process. It had to be an exact amount which meant making multiple trips to get a price and to make the purchase. This meant purchasing things at a higher cost because we went to the closest place rather than say getting it on a Sams Club run. I hate filling out paper work. It just feels like a needless bureaucratic process. This breaks down the feeling of “Church is Family” and we are a body working together. When the body works together it is a wonderfully and beautifully made orchestra of automation and design. This is how God designed our bodies so systems in the Body of Christ should reflect that image. The first digital form I made was a pdf form of the paper form. I used this to fill out requisitions for myself because I just didn’t like paper. 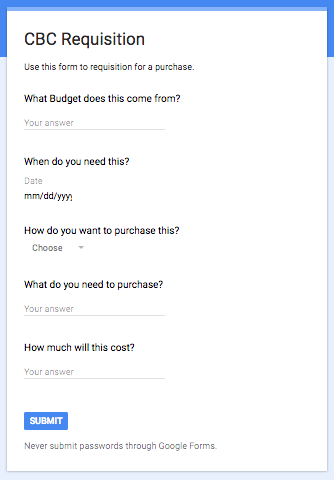 I experimented with google forms. This would dump the requisition into a Google Spreadsheet and email decision makers. I recently built a great requisition form using Planning Center Forms Planning Center is great. The form lets us see the form responses and emails the details to the decision makers, but that’s where the magic stops. After a form has been filled out there is no system to track it. After the form is sent it goes to email, but you can’t respond to the email. The sending address is a “no-reply@” address. When you submit a form and get no response, and have no status updates it feels like people don’t care. Even if they are working hard and communicating internally the lack of communication feels yucky to the requisitioner. The decision makers are now on their own to figure out how to deal with the requisition. Treasurer needs to check the budget and availability of funds and give that information to the executive pastor who then needs to magically juggle all this info in their brain and decide if we should purchase this thing now or later or never. Requisitions lack context. How much has this ministry requisitioned already this year? Where do they stand on their budget? How many requisitions did we already approve this week? How much have we already committed to outstanding requisitions? How was the giving this week? Do we have the cashflow to spend $500 on children’s curriculum right now? These questions require math. And you can only do the math if you print out the emails or export the form results to a spread sheet and do some spreadsheet magic. Either the Treasurer or the Executive Pastor has to manually track these things if they want context. Manually tracking stuff leads to errors. Even if the requisition is approved we still have to print a check or notify a person they can use an expense card. The final issue is that a ministry leader has no idea where they are at in their spending for the year unless they track it, or the Treasurer provides them with a report. This creates busy work for the Treasurer. The Treasurer & Executive Pastor is also flooded with requisitions. We purchase some things regularly so that means lots of requisitions. If we don’t make requisitions than there’s no way to track this week’s outgoing expenses. If you don’t know what’s going out then how can you approve a requisition? The regular spending of toilet paper, paper towels, cups, plates, coffee etc can fluctuate. These are purchased at varying intervals of time. Some are purchased every 3 months, some every week, some once a year. Neither requisition system tracks these expenses. There is no projection of what will be spent at regular intervals without lots of admin work. Ministries run on cycles and if the cycles are aligned then we may be purchasing several curriculum packages at the same time the heating bill skyrockets. It would be nice for the requisition system to nudge ministry leaders that they spent a large sum last August and maybe they should submit that requisition in April rather than wait till the last minute. Great people are not great at all the things. Sometimes people are great with teaching, or people, and teams, but bad with paper and remembering stuff. We limit who can serve when our systems don’t account for this. The administratively gifted people in the body of Christ should not have to bear all the burden of catching the dropped pieces. What solution have you found for these issues?